The true crime drama Narcos: Mexico will continue its intoxicating run. Netflix has renewed the spin-off series for a second season, the fifth overall for the streaming giant's highly rated serial. The news comes mere weeks after the debut of the first batch of episodes, which constituted a hard reset of Narcos' three Colombia-set seasons. Per The Hollywood Reporter, there's no word on whether star Diego Luna will return, as he is set to lead a forthcoming Disney+ streaming series centered on his Rogue One: A Star Wars Story character, Cassian Andor. Coincidentally enough, Luna took over the lead role in Narcos: Mexico from Pedro Pascal, who starred as a DEA agent in pursuit of legendary drug lord Pablo Escobar during Narcos' run. Pascal will appear in the title role in The Mandalorian, the other Star Wars series in the works for Disney+. Narcos has been an extremely hot property for Netflix, and given its recently-inked pact with series showrunner Eric Newman (who also produced the streamer's big-budget Will Smith feature Bright), the renewal was not completely unexpected. Wright had previously expressed his enthusiasm for continuing the series for as long as Netflix wants him to, and given the open-ended nature of Narcos: Mexico's first season, he clearly has some pretty solid ideas about where to take the story. The first two seasons of Narcos, shot on location in Colombia, focused (spoilers) on the pursuit of Escobar (Wagner Moura) as he built his cocaine empire during the late '70s and into the '80s. The third season dealt with the fallout of Escobar's death, as his former rivals in the Cali cartel — along with one-time members of Escobar's organization — rushed in to fill the void left by the drug kingpin's absence. That season wrapped up its story in the early '90s, with the Cali cartel's four bosses either dead or in prison. Narcos: Mexico was originally developed as a fourth season of the main series, but became its own entity as the narrative made a time jump back to the '80s, and shifted the setting to (where else?) Mexico. The spin-off's first season explored the origins of that country's drug organizations through the eyes of DEA agent Kiki Camarena (Michael Peña), as he zeroes in on the Guadalajara cartel, headed by Félix Gallardo (Luna). 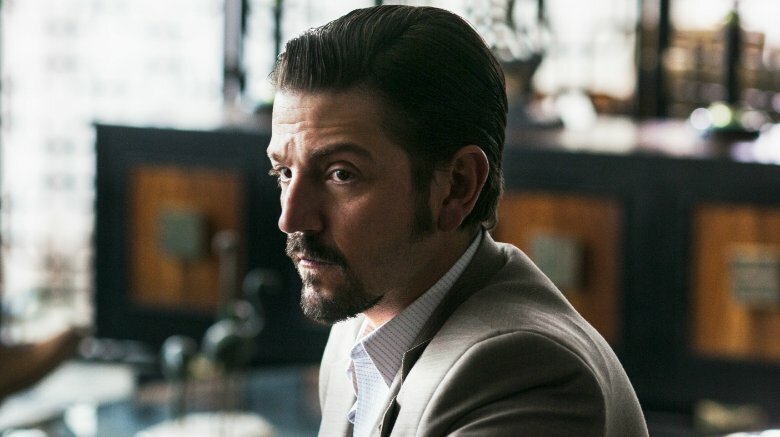 Since season 3 ended (more spoilers) with the shocking assassination of Camarena, it's highly unlikely that Peña will return. The season's final scene introduced mysterious DEA agent Walt Breslin (Scoot McNairy, Destroyer), appearing on camera for the first time after serving as the entire season's offscreen narrator; it stands to reason that this character will be taking over the role of chief protagonist for season 4. With venerable Netflix dramas House of Cards and Orange is the New Black wrapping up their runs, it's apparent that the streamer is looking to the Narcos brand to help fill the sizable void left by their departure. When all is said and done, Wright may get his wish — after all, there are plenty of stories in the long and sordid history of America's drug war left to be told. Season 2 of Narcos: Mexico has no announced release date, but if history is any indication, it's likely to premiere sometime in late 2019.